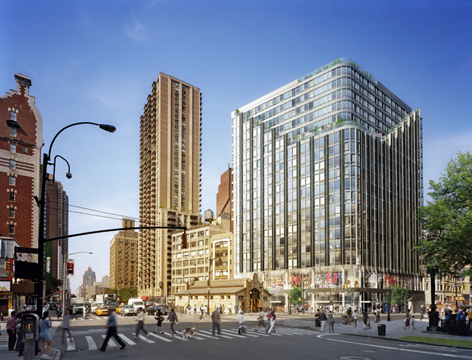 Plans for the redevelopment of the southwest corner of Broadway and 72nd Street, one of Manhattan's most important intersections, were revised in late 2008 to call for a 19-story building with 196 rental apartments rather than residential condominiums. The building, which was developed by the Gotham Organization, also has about 48,000 square feet of retail space on five levels. The design of the building by Gary Handel was been changed from a one-color, glass-clad structure to one with stepped setbacks on its west and north facades on the top five floors and the facades behind the setbacks is of a darker glass than the rest of the building. While the new facade design is more articulated, it is, sadly, not a substantial improvement to the overall boxy and uninspired design, which is out of context with its surroundings at this very major Upper West Side intersection. The apartments range from studios with about 500 square feet to three-bedroom units with about 1,600 square feet. The building has a children's play area, a gym, concierge service, a lounge and two outdoor decks. The building's address is 2075 Broadway and it is directly across Broadway from the southern section of the 72nd Street IRT subway station, an express stop, and across 72nd Street from the handsome Alexandria apartment building. The building, which also has an address of 200 West 72nd Street, replaced a 6-story building that was originally the Colonial Club. Several preservation groups sought unsuccessfully to have the former club building designated an official city landmark. An article on the Colonial Club by Christopher Gray in the December 6, 1987 edition of The New York Times said that "Founded in 1889 as the Occident Club, it changed its name to the Colonial within a year, the new name deriving from a stated endeavor 'to perpetuate the memory of Revolutionary days,' including the retreat of Washington's army from Long Island along the line of Broadway to Harlem Heights in 1776." According to Mr. Gray, "Members first met in an old rowhouse at 127 West 72d Street, but their number grew to 400 in one year and this encouraged the club to erect its own building at the junction of the West Side's two major arteries in 1892." "Designed by Henry Kilburn, the clubhouse was a sort of colonial palazzo," he continued, "mixing rich renaissance forms with light Adam-style detailing....Inside, the new clubhouse had a ballroom that was 82 feet long with 25-foot ceilings, a cafe, apartments for members and smoking, dining, writing and billiard rooms. The Colonial Club was unusual in that it permitted women as guests of its male members. The separate ladies' entrance and ladies' rooms in the building were actually quite liberal innovations since men's clubs in midtown excluded women altogether. There was also a ladies' bowling alley, with a half partition that screened the women - but not their pins - from the men, who used the adjacent lanes." The club ran into financial difficulties and was sold at auction in 1903 and three years later was converted to offices and stores.